Creamy Milk Chocolate and rich Dark Chocolate each blend their sophisticated qualities with fillings that can range from garden fresh mint to cinnamon, nutmeg and clove. 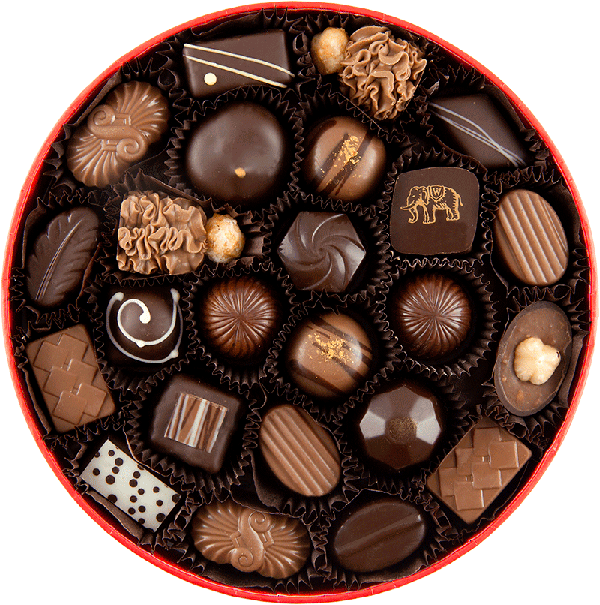 Your box may include: Espresso, Dark Hazelnut, Peanut Croquant and Pecan Caramel, though all boxes vary. Please see our index of chocolates for descriptions. Our chocolates are best if consumed within 7 to 14 days of delivery. INGREDIENTS: Sugar, unsweetened chocolate, cocoa fat, dry whole milk, full cream milk, soy lecithin added as emulsifier, natural vanilla flavor. MAY ALSO CONTAIN: Cream, butter, pecans, hazelnuts, almonds, pistachios, peanuts, coffee beans, cocoa beans, cherries, raspberries, passion fruit, honey, coconut milk, almond extract, Amaretto, lemon, Champagne Cognac, spices, fresh mint, Alize, Malibu, coconut, Brandy, Framboise, glucose & pectin. ALLERGY WARNING: Gluten free. May contain peanuts, tree nuts, dairy & soy. Copyright © 2019 Woodhouse Chocolate All rights reserved.